- “Hypnotic Visual and Audio Event”- by Uri Klein, Ha’aretz, Tel Aviv. - “The combination of the film and Acher’s performance created a highly inspiring cinematic-musical experience. … purely modernistic in character, blasting around the film, encompassing, supporting, and enhancing it.” -by Uri Klein, Ha’aretz, Tel Aviv. -"Spell binding, action packed and deeply original"- Berlingske Tidende, Copenhagen. -”The alert and poetic flute of the leader interact their inventive lines, supported by a dynamic energetic rhythm”- JAZZ magazine, Paris. - “The idea of light emerging, dying, emerging again is a sensual one and it is done here with great beauty and avocation” – New Music Connoisseur, NYC. -“Suite for the Spirits” conjures water nymphs with subs aqueous wow drifting overdub interplay, wavy arpeggios, and eerie inhalations… Sophisticated multitracks and electronics create glinting, spooky “Audio Images”.” By Fred Bouchard, All About Jazz, NYC. 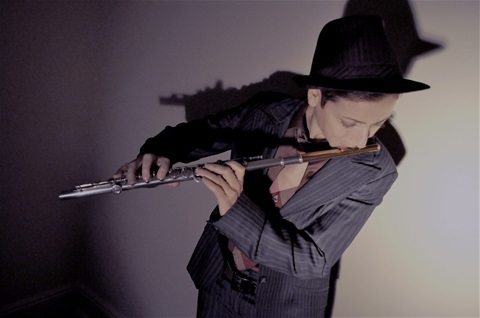 - "Yael Acher is a flutist who isn't about faking the funk. Instead of floating diaphanous tones on top of innocuous smooth jazz, her hard-edged Junk Kat Modiano ensemble is run from the kick drum. "- Time Out, New York. - “A bold, daring Bach –solo by the flutist Yael Acher, which initiates the spatial body energy in the beautiful pillar-yard, with her crispy tones and her androgynous jacket suit movements.”- INFORMATION, Copenhagen. Master Degree Courses in Music Composition. Bachelor Degree; BA in Classical Flute performance Arts. Classical, Contemporary, Free-Improvisation, Eclectic-contemporary electro/instrumental Jazz, Free Jazz, Funky, Electronics, and live Electro/acoustic music for Silent Movies and music for choreography, in collaborating with ensembles, choirs, Modern Dance,Film directors, Visual artists, DJs, MC Poets and Spoken Word Artists. Live/Composed Electro-acoustic Soundtrack for Silent Film at: United Palace, Lincoln Center Library for Performing Arts and Bruno WAlter Auditorium in Lincoln Center, The Jewish Herritage Museum, The High Line, in NYC; Spectacle Theater, in Brooklyn, NY; Outfilm in Hartford CT; CIMM in Chicago, IL; Queersicht, in Bern, Switzerland; Danish Film Institute, Cinematek in Copenhagen; TLVfest- international LGBT Film Festival, Tel Aviv Cinematheque. Classical & Contemporary Electro-acoustic performances as a composer / interpreter at: Roulette, Church of Transfiguration, Church of Heavenly Rest, St Anne and Holly Trinity Church,Church of the Intercession ,St. Cabrini Shrine, Rubin Museum, BAM, and New York Botanical Gardens in New York City. Sound Symposium festival in Canada, Lund Dom Church, in Sweden, Round Tower and numerous churches and galleries in Denmark, Braila New music Festival in Romania, Immanuel Church in Israel, and more. Leading Jazz group ”KAT” Modiano(previously: Junk “KAT” & Modiano)with originalelectro-instrumental progressive groove- jazz since the 90’s in Copenhagen, Denmark and currently in NYC and Europe, with international performances at venues such as: Blue Note, Dizzy’s Club Coca Cola, BAMcafé, Bargemusic, NJPAC (New Jersey Performing Art Center), Newaark Museum, Jazz forum in NJ, Copenhagen Jazzhouse, Copenhagen Jazz Festival, Malmo Jazz Festival, and more. Performs throughout Europe and New York, in collaboration with rappers, DJs and video artists. Music for Choreography performances as a composer/performer at: Susan Dellal Centre for Modern Dance, in Tel-Aviv, the Fringe Festival, in Edinburgh, Lille2004, in France, Copenhagen Dance Scene, Copenhagen Summer Dance Festival, Tokyo, Japan, Tribeca PAC in NYC, Fire Island Dancers for Aids and Las Vegas University. 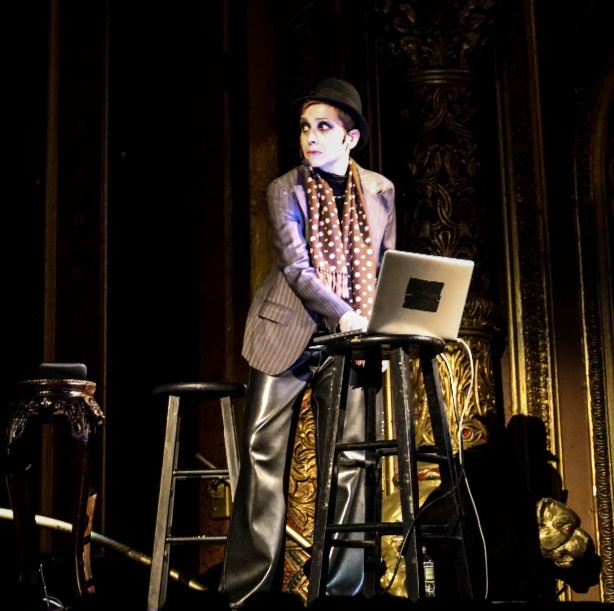 Collaborations with choreographer/dancers: Kim Itoh (Japan), Tim Rushton (UK, Denmark), Mink Colbert Dance (Europe and USA) and Ellis Wood (NYC), Prismatic Production and Ollom Dance (NYC), Corvino Ballet (NYC). Therapeutic performances at: Hospice Residencies, Shelters for Homless, Shelters for Domestic Violence Survivors, and Juvenile Detention Centers in NY, NJ and CT. Reviews and Feature articles internationally: New Music Connoisseur, Cadence Magazine, All About Jazz in NYC, Jazz Magazine in France, Third Ear, Ha'aretz in Israel, Informations, Jazz Special in Denmark and more. Broadcasts in radio stations in: Denmark, Spain, France, Rumania Canada, Mexico and the USA. Awards and Grants:Fulbright Commission Scholarship, Foundation for Contemporary Art, Northern Manhattan Arts Alliance, American Scandinavian Society, Lower Manhattan culture Council, Copenhagen Culture Foundation, Danish Art Council, Danish Artists Union, Danish Jazz Foundation, Danish Musicians Union, Fresh Fruit Festival, International Women in Jazz, and more. - “Redcar”, MODIANO 0501, featuring “KaT”-inDustrial, releases in DK 2001. -“KAT” &”MOON” in Manna-hata- Jazz and Electro-acoustic flute- released in NYC 2014. - Compilation: Classical and Crossover Chamber Music- Syrinx Duo (flute and harp), Trio Dolce (flute, violin/viola and cello)- recorded 2008- not released. - “Buddy & Soul”- DVD production (flute & effects and guitar- funky jazz duo)- recorded 2009- not released. - “Kat” Modiano Quartet live at BAMcafé, recorded 2010- not released.